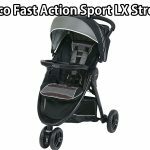 The Graco Fast Action Fold Jogger combines the features of a baby stroller plus and features of a premium baby jogger. Its light weight helps in easy maneuverability but can carry a baby load as heavy as 50 pounds with ease. The canopy is oversized so it can shield your baby from sunlight while you enjoy your jog together. The aired wheels add more comfort to the suspension as you can hardly feel the bumps in any kind of terrain. You have also the option to lock the front wheels to just go on a straight line or have it swivel freely as you manage through hilly slopes. Folds up fast with just a few pulls at the straps. Can stand on its own folded. 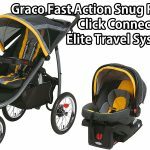 Can be converted into a travel system within seconds by just connecting any compatible Graco click connect car seat. Can accommodate a baby as heavy as 50 pounds and can seat the baby in different recline positions for greater jogging enjoyment. Air-filled rubber tires provide better suspension so that bumps do not feel as much. Stroller has a deluxe parents tray to secure smart phone or MP3 as well as 2 cup holders. Stroller also has reflectors for low light visibility. Most of the buyers say the stroller is very sturdily built: however, a good number of buyers have also commented that it is a bit huge and that for averaged height people (from about 5 ft 1 inch to 5 ft 5 inches). it is a bit on the high side so it is hard to look ahead as handlebars are a bit high. A number of buyers also said that the stroller is a bit heavy and will not fit on a car’s trunk. Thus, even if it folds easily, transporting it could create a problem. Some of the accessories of the stroller are of m=not much use to the caretaker/parent: phone cradle is too small and also not adviseable to be put on the stroller pouch. The cup holder also can only be one instead of 2, so that there would be more space for the baby to move around. The product brochure states that the stroller can carry a baby between 5 and 50 lbs. However, considering that a 5-pound baby cannot even support his weight, the use of the jogger by babies as small as 5 pounds to about 7 is not advised. Remember that at this size, the baby has to be handled with care still as he cannot move by himself yet. Most probably, the time to start him on the stroller/jogger would be during the time he is able to push or move himself alone while lying down or when you can see that he is able to use his feet to move about even while just lying down. With regard to the stroller accessories, a re-evaluation on whether or not the current accessories included should be continued. Some of the accessories like the phone cradle and 2 cup holders do not seem to augur well with the users. Taking some of these could greatly reduce the weight of the stroller making it lighter and easier to handle.